Card Text Play: Choose a house on your opponent’s identity card. 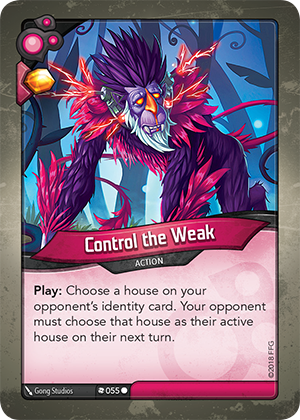 Your opponent must choose that house as their active house on their next turn. My opponent plays both Restringuntus and Control the Weak, selecting the same house for both. Can I select a house on my turn? Yes. “Cannot” effects take precedence over “must” effects. Therefore, Restringuntus would effectively override the effect of Control the Weak and you would be able to select either of the two house not restricted by Restringuntus. What happens if I play two copies of Control the Weak and choose two different houses? If a player is faced with two (or more) “must choose” mandates, the player may choose either of those options. What happens if I play Control the Weak and choose a house other than Dis while my opponent has Pitlord in play? If a player is faced with two (or more) “must choose” mandates, the player may choose either of those options. So this would allow your opponent to choose a house other than Dis, even with Pitlord in play.